With over 180 specialty stores and a great selection of department stores, Somerset Mall is not to be missed. Located at the corner of West Big Beaver Road and Coolidge (just west of I-75), the mall is home to several restaurants including the “Peacock Cafes” food court, as well. For a formal (and somewhat pricey) meal, stop in at P.F. Chang's Chinese Bistro for family style dining, or for those who aren't fond of Asian food, try McCormick & Schmick's. At the food court, you'll find favorites like Sbarro, Starbucks, Haagen Dazs, and Salad Sensations. 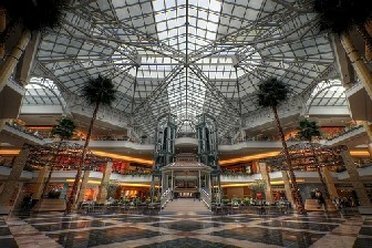 Somerset Mall itself is a work of art, featuring end to end skylights and museum quality art. A 700-foot long skywalk connects the North Somerset Mall with the South Somerset Mall. Valet parking is available, as is a coat and parcel check service inside, giving the mall a very upscale atmosphere. Shopping should include a stop and Border Express, where you can buy books, calendars, stationery, and many other odds and ends, and a trip to Pottery Barn for that little knick knack or that piece of furniture that will complete the look in the room you're redecorating. Sharper Image always has something fun and exciting to purchase, and who can resist the Disney Store or Gymboree to find a cute gift for the child in your life? You can even stop by Heidi's Salon for a trim or style while your at the mall. Somerset Mall is open from 10:00am to 9:00pm Monday through Saturday, and from 12:00pm to 6:00pm on Sunday. Don't spend all your time in Michigan fishing – be sure to plan a trip to Somerset Mall for great shopping and star-quality treatment.